Today was the first day to sell fireworks legally in Washington State. That is expect for on the reservations. So here is some info on what is available from a number of local fireworks stands and booths. If you would like info about any other retail fireworks locations on the eastern side of Washington State, please let me know. One of the best known brands. I visited both a tent and a booth location today and was surprised at the differences. The tent location had a much better selection of products. Both places had the same prices from what I could see. 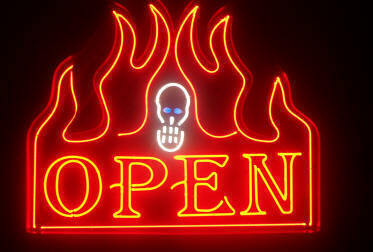 Remember that you pay for the brand name with TNT. Most of the prices were higher then what I found else where. No fliers, but I will have coupons soon, so check back. AWOL Phantom Fireworks seems to have given up on Washington State. Can’t say that I am surprised. They did always have better prices then TNT though. I will be posting coupons for those who do live close to a show room or tent location. 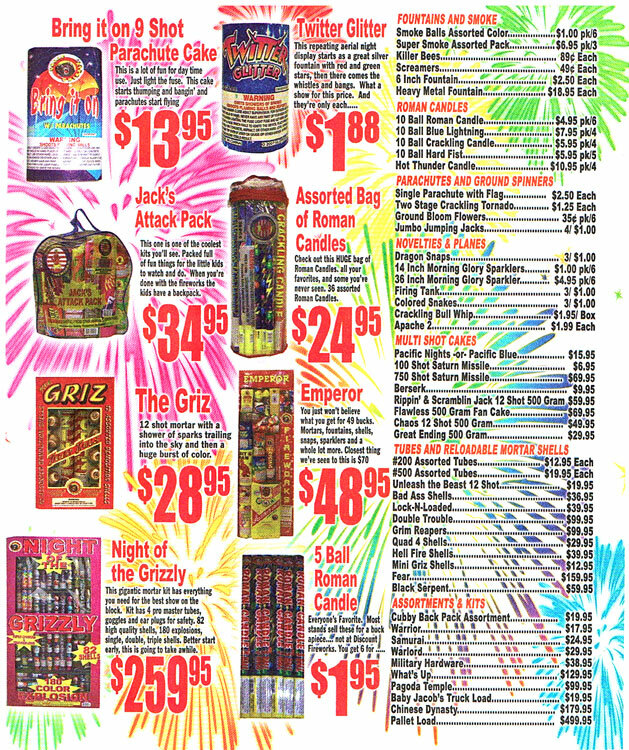 A generic branded company selling mostly Grizzly brand fireworks. Great selection, and good prices as well. One thing that has impressed me is the lack of duds from Grizzly fireworks. 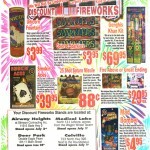 I was told that Discount Fireworks does have a website, but no one seemed to know how to find it. No coupons, but I did get their flyer. This little booth is all there is for this company. I found a brother and sister team running this booth. Having earned the opportunity from what their parents started. The fireworks here have been selected by the person selling them. While the selection was very small, the quality seemed good, and the prices were low. 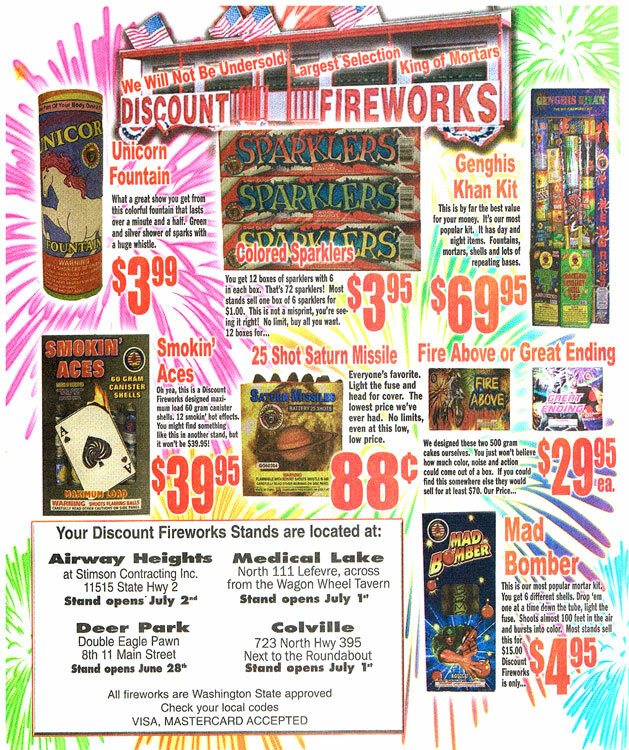 I wasn’t the only one to get a flyer from Discount Fireworks. The siblings at Eagle told me they bet all of Discounts published prices. No coupons or flyer from Eagle. 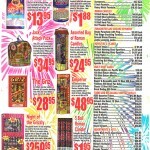 This entry was posted in Consumer Fireworks and tagged 1.4g, Fireworks.com, Phantom Fireworks, TNT Fireworks, Websites by Richie. Bookmark the permalink. Thanks for adding the link Blake!